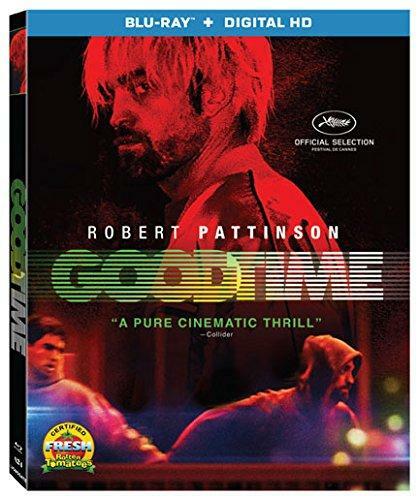 Good Time is a frenzied crime thriller that marries a hypnotic docudrama style with a heartbreaking tale of two disconnected brothers. Robert Pattinson disappears into the lead role with a truly memorable performance. This Blu-ray release features an often stunning but inconsistent 1080p presentation with an excellent DTS-HD 5.1 audio track. Supplements are respectable and should satisfy those curious about the film. This HD release of Good Time is Recommended. We love anti-heroes. They question authority and look out for those trapped by society’s ills. They’re a rogue spirit that ignores convention and just gets the job done. In the crime thriller Good Time, our anti-hero looks and acts the part but only has the best intentions for saving the day. Co-directors Josh and Benny Safdie portray the frenzied journey of a man out to save his brother’s life but ends up making things worse for those he cares about most. Ultimately his efforts are more damaging than supportive. What good is a hero if he can’t even help you? Are good intentions enough? Constantine Nikas aka: Connie (Robert Pattinson) is a low-level criminal who looks after his learning-disabled brother Nick (Benny Safdie) in a manner that might seem counterproductive. During one of Nick’s court-appointed therapy sessions, Connie leads him out of the room just as he was having a breakthrough with his therapist. Donning masks the two brothers rob a bank as easily as it was for Connie to convince Nick to “help” him pull off the job. When the escape goes awry Nick is caught by the cops and sent to Rikers Island. Connie works tirelessly through the night to scrounge up the necessary bail money. Before he is able to collect the full amount Nick is hospitalized after getting into a fight with another inmate. When Connie can’t seem to get the cash in time he decides to bust Nick out of the hospital. What transpires is an exercise in hustling, fast-talking, and keeping your stories straight. Pattinson’s Connie is a greasy yet charismatic criminal who cannot wait for the present. His hyper-awareness works to dig himself out of trouble but rarely keeps him out of the crosshairs. How he navigates the hustle and those he involves is indicative of a life lived in the underbelly of society. Side girlfriend Corey (Jennifer Jason Leigh) though living in a swanky high rise with her mother easily falls prey to Connie’s kind eyes and ends up crying over her mother’s canceled credit cards. Leigh’s work is spot on her constant return to these types of characters feels a bit clichéd. Other supporting characters can relate to Connie’s troubles with the law or at least the story he presents to them. Slacker teen Crystal (Taliah Webster) and parolee Ray (Buddy Duress) are inexplicably thrown into the mix and decide to help him with only mild hesitation. One of my favorite lines occurs when Crystal attempts to rationalize Connie’s situation to which he replies, “Don’t be confused it’s just gonna make it worse for me”. We’ve all been there, right? Good Time is a tense thriller with brotherly love at its heart. As a far-reaching comparison, it reminds me of something like Run Lola Run. From one problem to another Pattinson’s character is ready to dive in without looking. Co-directed by Benny and Josh Safdie, the brothers combine 35mm handheld cameras with slick cinematic shots to give this run and gun feature some real substance and a mature presentation. The lack of visual clarity gives a docudrama feel that accentuates the already gritty atmosphere of the film’s urban setting. Scoring is spot on thanks to Oneohtrix Point Never providing a synth-heavy score that steals the film for me. I had some doubts going in thinking that this would be a mess of stereotypes and attempted method acting held together with an electro score meant to distract. Boy, was I wrong. Though marketed simply as a crime thriller with heartthrob Pattinson looking shaggy, Good Time has some real meat on its bones with heavy emotional themes and a wavering moral compass. Connie just wants a better life for his disabled brother Nick so badly he is willing to lie, cheat, and steal at a breakneck pace. We may not agree with his values but love is love no matter if it's your brother, your fling, or some random teenager helping you get some chicken nuggets and hair dye. What the Safdie brothers have done is craft an engaging thriller with heart that doesn’t stop even as the end credits start rolling. Good Time arrives on Region A Blu-ray thanks to Lionsgate and A24. The film is pressed onto a BD25 disc and packaged in a standard keepcase with slipcover and an UltraViolet Digital Copy. The disc opens with the Lionsgate Logo followed by trailers for A24 films Woodshock, A Ghost Story, The Rover, It Comes At Night, and American Honey before landing on the Main Menu. Typical navigation options are available. With an AVC encoded 1080p transfer in 2.39:1 Good Time looks clean with colors that pop. Film grain and handheld cameras give the feature an intense and hazy patina that works well to establish a visual tone from the start. Set mostly at night the black levels are stable during establishing shots and close-ups but become inconsistent otherwise. Fine detail is present in skin tones and costuming. Using available light sources such as flickering TV screens, street lamps, and neon bulbs Good Time looks curiously like a DIY Blade Runner. Good Time comes with a single DTS-HD MA 5.1 audio track. It’s the only way you should experience the pulsating electronic score from Oneohtrix Point Never. Though only similar in tone, I was reminded of the It Follows score from Disasterpeace when I was watching this film. The textures used in Good Time’s music are reminiscent of John Carpenter-era horror scores combined with a hypnotic yet pulsating drive. Dialogue is clear and clean through the feature. Surround channels are used effectively with subtle scoring elements and atmospherics balancing the front/center ambush of sound from this chaotic film. I kept the volume level at a mid/high setting once I realized how much the music was keeping my attention. Good Time is an intense and unusual film that works on many levels with the crime thriller element hiding a heartbreaking story about two brothers. Stylistically, the film is a hyper-reality machine that burns with white-hot intensity. Performances are strong all around with Pattinson turning in some interesting character work here. Lionsgate’s Blu-ray arrives with a sometimes-excellent A/V presentation and limited bonus features that are still worth a look. Good Time is Recommended.